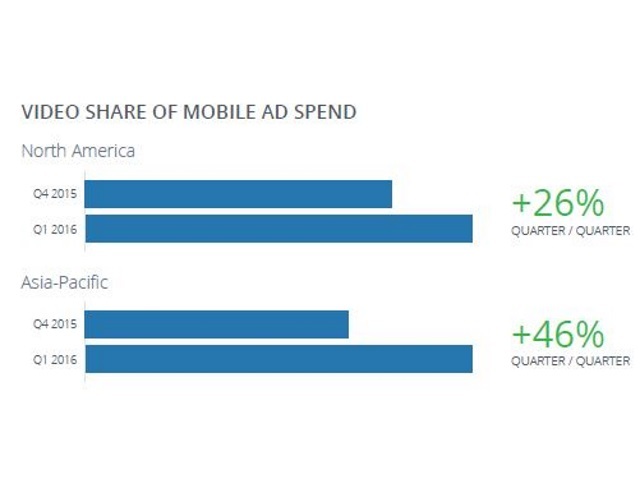 Digital advertising automation software provider Nanigans, a Facebook Marketing Partner, analyzed ad impressions delivered by clients using its software in the first quarter, and it found that video accounted for 26 percent more mobile ad spend in North America compared with the fourth quarter of 2015, and a whopping 45 percent more in the Asia-Pacific region. Nanigans said more than 35 percent of ad spend from game developers in the first quarter went to video ads, up 25 percent quarter-over-quarter and 122 percent year-over-year. E-commerce advertisers continued to see strong returns on investment, largely due to Facebook’s carousel ads and dynamic product ads, with average order value and return on ad spend up double-digits compared with the first quarter of 2015, and same-advertiser purchase rates up 170 percent over the same time period. More than 60 percent of e-commerce Facebook ad spending was targeted toward mobile users, up 15 percent versus the fourth quarter of 2015. Click-through rates of 1.25 percent for the first quarter were up 11 percent from the fourth quarter of 2015 and 54 percent year-over-year. E-commerce CTRs saw a 24 percent quarter-over-quarter gain, the largest since the third quarter of 2014, reaching 1.32 percent, while gaming advertisers set a CTR mark at 0.84 percent. As expected, cost per thousand impressions (CPMs) were down versus the fourth quarter of 2015 and the holiday shopping season, slipping 7 percent to $5.94, but up 39 percent year-over-year. Gaming advertisers saw a 9 percent quarter-over-quarter drop in CPMs, and Nanigans attributed part of this to the expansion of Facebook Audience Network. Cost per click fell 16 percent compared with the fourth quarter of 2015 and 10 percent versus the first quarter of 2015.